Last week I stumbled across DailyBlogTips.com. I’ve been visiting frequently since then, and I’ve chosen them for SiteFever’s Favorite of the Week. DailyBlogTips has well-written original content and is updated quite frequently. Today, they’ve released a new post titled Top 25 SEO Blogs. It’s obvious that some time was taken to write this post, and a chart was made showing each blog’s ranking for Google, Alexa, Bloglines & Technorati. Although SiteFever.com didn’t appear on the list, I can’t argue with their choices. Someday maybe we’ll start ranking up there on everyone’s top picks. They’ve also just recently decided to display only excerpts of each post on the homepage, the same as I do. I have decided to use only excerpts on the homepage because I don’t like the homepage to be a mile long, and I don’t want my site visitors to have to sift through a bunch of posts they may not be interested in. By having post excerpts on the homepage, this allows more articles to be listed- for example 8-10 excerpts of recent posts rather than only 4-5 full posts. Getting back on subject, DailyBlogTips reports a very impressive 4,350+ RSS subscribers to their RSS feed and boasts articles in 18 different categories. 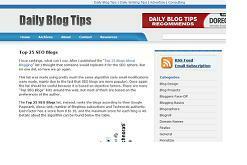 For these reasons, DailyBlogTips.com has been chosen for SiteFever’s Favorite of the Week. Also, regarding the Top 25 list, I did not choose the blogs, I browsed among almost 60 of them and checked the stats for the mentioned factors, there was not subjective influence whatsoever :). I was not complaining there… just a little bit of sarcasm I guess!